Nashville-born feminist artist Vadis Turner tenderly traces the female experience with materials often associated with womanhood. 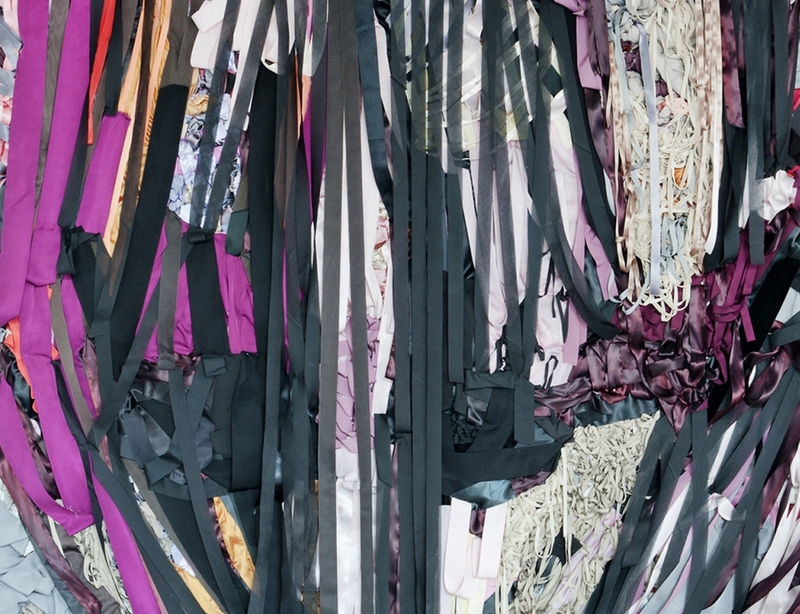 She uses second-hand textiles like ribbon, bedding and clothing to construct lush, provocative abstract assemblages brimming with history and contemporary lyricism. Her first museum show, "Tempest," on view at the Frist Center's Gordon Contemporary Artists Project Gallery, simultaneously celebrates and challenges traditional female roles by examining three archetypal phases of a woman's life — the young Wild Woman, the Mother, and the Elder. Turner spoke with The Tennessean over email about her work and the show, on view through Sept. 10. Have you always been interested in expressing the female experience? I never made a conscious decision to be an artist, let alone a feminist artist. It was what I knew how to do. I investigated my interests and brought them into the work. I studied painting as an undergraduate and am forever brainwashed to see everything as a painting, even when it’s far from that in reality. Although I don’t use a lot of paint, I consider myself to be a painter. I am really interested in transformative possibilities of domestic materials and how to use them in ways where they can be perceived as paint and communication tools. Why use abstraction to express these subjects? That's just the language I speak. I like to combine several ideas or stories with contrasting elements to generate each piece. In recent works, I edit each composition down to the most invaluable component, trying to say more with less. How important is color to your work? Color is a incredibly important part of the visual vocabulary for all artists. I love how color seems to have volume, speed, pitch, taste and perceptual presence in space. I used to teach a color class at Pratt Institute, and I never tire of how thoughtful and descriptive color relationships could be. Your work often addresses biological aspects of womanhood. How do you contend with the enduring controversy of these topics? It is curious to me why the female system and its outputs are so uncomfortable to people. We would not exist without the processes. Is it too simple? Too obvious? Too gross? Have we evolved so much that we want to sweep these primal acts, breast feeding for example, under the rug? To be fair, I was a little uncomfortable making the work in the “Mother” series, but at the time, the female reproductive system was my true story. When did you start using mixed media in your work? I took a break from painting after I graduated in 2000. I moved back home for a brief period and started to experiment with kitchen supplies from my mom’s house. Wax paper in particular has beautiful sculptural qualities. One material lead me to the next and so on. I collect materials that women use to adorn themselves or their spaces. Most of the works in "Tempest" are made with recycled textiles, although I do have to purchase ribbon occasionally. I incorporate clothing that my kids have outgrown. I cut up retired bedding. I am especially drawn to textiles that were made by previous generations of women, so I buy damaged hand-sewn quilts on eBay. I like the idea of reinventing the future of unwanted pieces that were made with time and care. People give me all sorts of wild and wonderful things, too. I am attracted to things that are hard to classify. I hope that the materials transcend their original association/function and that the works are seen as thought-provoking paintings. Preparing for my first museum show presented all the levels of pressure and intimidation that I have been wishing and hoping for my whole career. I am very proud of the show and incredibly thankful for this exhibition opportunity.